Empowers Patients to Care for Themselves! acuProducts are powerful clinical tools enabling practitioners to release tight areas in their patients DURING TREATMENT, saving their hands and significantly improving clinical outcomes. acuProducts are also given as empowering home care tools to patients to further their healing IN-BETWEEN TREATMENTS. How do you normally treat anterior compartment syndrome? Most practitioners don’t! Here we see the heated acuBack releasing the anterior compartment in a patient WITHOUT the health professional needing to do any manual release work. The patient does it all themselves using their own body weight. Hospitals use the acuProducts for a wide range of conditions from hand & MVA rehabilitation to re-invigorating burn tissue and birthing wards. Many insurance companies will reimburse clients for their acuProducts purchase since health care savings are considerable (20-40% decrease in care) for 3rd party payers. Over 3000 therapists around the world use acuProducts clinically. A patient complains of upper back pain and during your exam you find a tight T3-5 area with adjacent para-spinal myofascial hypertonicity – very common in today’s computer using client. Assuming no signs/symptoms of organic disease are present your job is to try and restore movement to these joint segments and release the area. After reviewing your patient’s ergonomics and showing them how the acuBack placed behind the low back restores normal lordotic curvature (and with it upper back and neck posture) you begin to treat – see video link acuBack. With your patient lying supine on your treatment table, place the large heated acuBall with the recessed groove (to accept the vertebral processes) under your patient’s T3-5 area, where you palpated maximum contraction, and instruct them to deep breath into the spot they feel tenderness. Within 2-3 minutes a marked relaxation response will occur with most patients closing their eyes and going into a relaxed state. Note: if the condition is long standing the use of a very soft surface is recommended to start (bed works well).The area is normally painful for the initial 30-60 seconds of use as the joints, connective tissue and muscle begin to release. Within one minute the pain will substantially decrease and a pleasant ‘opening’ sensation will be felt by the patient. Always remember to treat BOTH sides of the body for best results. So next turn the patient prone and have them align the acuBall underneath their sternum searching for the most tender area. Once they’ve found the spot – it will be tender – instruct them to deep breathe and completely relax letting the weight of their head & neck completely release – their forehead will now rest on the back of their hands with palms facing downward – see video link upper back pain. This same principle also applies to low back pain patients where the symphysis pubis on the front of the body is treated as well as the low back – see video link sciatica. After five minutes remove the acuBall and to re-palpate the area. Notable decreases in myofascial tone and improved T3-5 joint motion will be apparent. Now continue forward with the techniques of your choice – the patient will be much easier to treat and you will have saved your hands! 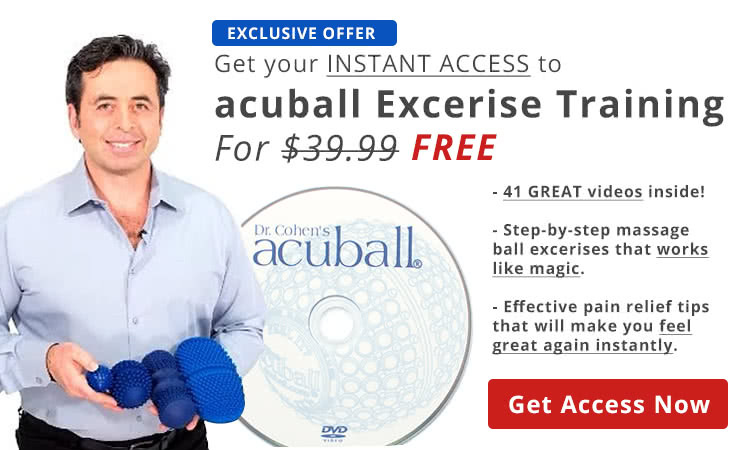 1/3 of patients who experience the acuBall clinically will want to purchase it as well. We’ve made it simple to train your patients on how to use the acuProducts with our complete online training videos – just tell them to click where they hurt on the model; it’s that simple. Health care professionals are notoriously bad at taking care of themselves. Use your acuProducts to keep your body tuned, just like Dr. Oz does. Extend your practice life and improve your clinical performance 100% naturally with your acuProducts – try releasing the chronically forward flexed T9-10 area that occurs from hunching forward treating patients all day. Improved clinical performance and reduced pain go a long way to making you more effective, happier and healthier.